A list of hobbies for your full time RV lifestyle is just what the doctor ordered. You are not going to travel all the time and life can't stand still until you get on the road again. We all know that experiences make us happier than things. It's why we become RV Vagabonds. It's why we travel and meet new people! So what will you do with your time to keep life interesting, challenging and most of all fun when you settle some place for a while? I will propose a list of hobbies below, though not exhaustive, that will hopefully peak your interest. Some are clearly hobbies that require tools and equipment. Two other categories I've labeled Fun Outdoor Activities and Portable Pastimes. So many on this list of hobbies are inexpensive pastimes that can provide hours of pleasure, create gifts for families and friends or lead to jobs after retirement if you are at that stage of life. Or maybe they can lead to a way become an RV Vagabond or to retire early! Some are less easy to do on the road, like stained glass making, quilting, scrapbooking and wood working. Even beading can take up lots of space due to the collections of beads accumulated over time. How have some found the ability to do it anyway? Many full time RVers stay long term in RV Parks where clubhouses offer space and resources to put quilt pieces together, buy beads for each project from a bead "store" on the premise, or assemble a wood working or stained glass piece. Escapee Parks are just some of these, but there are others, especially where people winter for extended periods. Make use of the outdoors, under your awning, using a portable table that folds and stores. There are canvas type rooms with screen windows and privacy/weather flaps that attach to an RV's awning. These are great to keep out the wind and dust and can be heated in cooler weather. There are free standing ones as well! If you live off the grid, like I do, then hobbies that use hand or rechargeable tools are perfect. They take up less space and use little or no power. You may be surprised to know, though, that sewing and embroidery machines use very little amperage so I'm able to embellish items even in the desert or at an outdoor venue using only solar power. I know some folks, one who has a welding shop and another couple a lathe to make wooden pens, both use cargo trailers in which they also transport their cars. I've seen Ham Radio Shacks in these as well. Make sure your rig can pull one though! And speaking of things that need space to do. . . did you know Scrapbooking can be done digitally? There are lots of websites, smilebox is a good example, and software for your computer that bring this hobby into the 21st century. Who knew! Again, where there's a will there's a way! I've had fun doing many of these in my short time on the road. 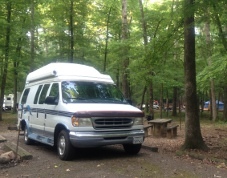 You hear of things, you meet people, you camp nearby a National or State Park with activities you can join in on. In Yuma I've gone with a birding group that meets every couple of weeks to go bird watching in a park by the Colorado River. A high school teacher pulled into Senator Wash LTVA in California and he gave a few of us a journey across the night sky that was amazing! I learned a lot that night! A National Monument in Texas had an evening put on by local university astronomers complete with powerful telescopes set up to view stars and constellations for free! A few of us camped together at Palm Canyon Trail Head in Kofi Wildlife Refuge in AZ for two days of hiking! Caution, small rigs only here! Then there are the, sometimes, low key types of portable pastimes I personally love. Movie watching from the favorites I own to the latest rentals via Redbox and Netflix is easy from the road. You can store all your DVD's these days on large hard drives that hook up to many flat screen TV's through an HDMI cable. These storage drives are getting more affordable! Puzzle making I've noticed is a favorite for many travelers. There's a great space saving mat called Ravensburger Stow & Go - Puzzle Accessories that not only eliminates the need to keep the box but let's you roll it and stow it when you travel or just need the table to eat off of! If you have been a gardener in the past, or just like fresh foods, sprouting seeds in mason jars can be a money saving, healthy endeavor. Alfalfa, mung bean and radish seeds are a good to start. I'm a reader. A good book, a comfy chair and a quiet campsite are a great and relaxing combination! I know this overall list of hobbies are just a beginning . . . to get you thinking! What are the possibilities? And I know many of you may have hobbies that you plan to take on the road with you, or already have. I know others would like a longer list of hobbies, to hear more ideas and especially more ways you are able to pull it off in a home on wheels. I know for certain more folks would like to know how you turned your hobbies into jobs after retirement! Below is a way you can share those stories with the world! Have Retirement Hobbies You Do On The Road? Share your story about your hobby or hobbies. . . illustrate what you do, tips to make it work, if it has become a source of income, why you think it's a great match for the full time RV lifestyle and whatever else that psyches you about your portable pastime or fun outdoor activity. Of course any funny anecdotes would be very enjoyable. And be sure to add up to 4 pictures that show and tell. Be sure to resize any photo larger than 800x600 pixels using your graphics software or a Web-based resizer, such as PicMonkey.